AIA Convention 2016 will be held in Philadelphia from May 19-22. 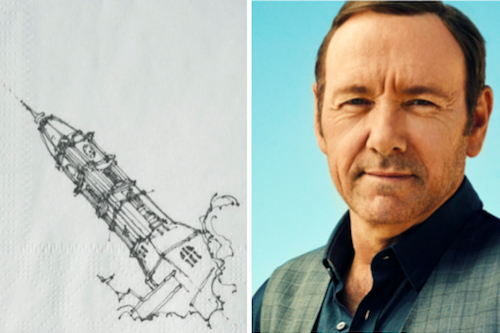 The carefree pastime of doodling on napkins may be largely supplanted these days by smartphone activities, but the American Institute of Architects wants Philadelphia residents to pick up a black ink pen and create inspired likenesses of their favorite spots in the city. The occasion for the contest is the return of the AIA Convention to Philadelphia in May, paired with the opening of the renovated and renamed Center / Architecture & Design in Center City. Also, if you're a fan of 'The Usual Suspects' and 'House of Cards,' you may want to mark your calendars for May 19: actor Kevin Spacey will provide the Day 1 Keynote on innovation, disruption and risk-taking. Every year, the AIA holds the free-to-enter napkin contest with a different theme, but to celebrate this year's homecoming, the Philadelphia Emerging Architects committee – joined by the AIA Convention Exhibit and Lounge Committees – wants you to share napkin scrawlings of your favorite local spaces, buildings, architects, and neighborhoods. If you have another idea inspired by Philadelphia, that's fair game, too. • Sketches must be in black ink on a 5'' x 5'' white napkin. Materials can include paper, mylar, vellum, or any other fibrous material as long as it's white. • All sketches must be submitted digitally here by the deadline. Winning entries will be showcased at the Philadelphia Center for Architecture and Design during the national AIA Convention from May 19-22. Learn more about the contest here and check out all of the events planned for AIA Convention 2016.